Substitute Isaac Success secured a point for Watford as they twice came from behind in a Vicarage Road thriller against Bournemouth. Callum Wilson headed the Cherries ahead from Junior Stanislas' deflected cross before Artur Boruc's double save denied Watford's Nordin Amrabat. Watford levelled through captain Troy Deeney's 99th goal for the club just after the break, a close-range finish after fine work by Morocco international Amrabat. Substitute Joshua King restored Bournemouth's lead with a long-range deflected effort 44 seconds after coming on before Success equalised with a header following Jose Holebas' free-kick. Incredibly, Bournemouth hit the woodwork three times in the second half. Jack Wilshere was twice denied by the post while Stanislas's free-kick rattled the bar late on. Watford played their part in a thoroughly entertaining match and showed much more fight than they did last time out at Burnley, where Deeney said his team-mates had allowed themselves to be "bullied" during a 2-0 defeat. Yet Walter Mazzarri goes into the second international break of the season still seeking a first clean sheet after twice conceding against a team that had previously scored just four goals in nine hours. Bournemouth had 11 shots in total to Watford's 17. However, the visitors scored from two of them and hit the woodwork another three times. Watford goalkeeper Heurelho Gomes should have kept out Wilson's close-range header, while King could not believe his luck as he was allowed to run unchallenged with the ball at his feet before finding the net from distance. While Wilshere was unfortunate to see a curling effort come off a post shortly after Deeney had made it 1-1, he was at fault for missing a golden opportunity to win the game when the score was 2-2. The England international was immediately substituted after shooting against a post when it looked easier to score. 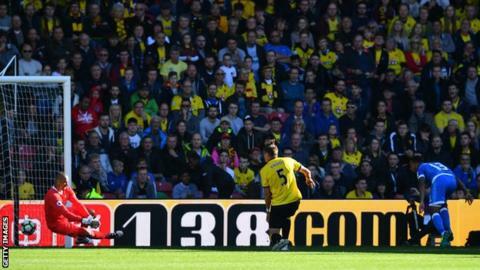 Watford had another let-off in the dying stages as Stanislas bent a free-kick around the wall only for the ball to strike the bar. Wilshere started his third match since joining Bournemouth on loan from Arsenal for the rest of the season. However, he has now gone 20 Premier League appearances without playing the full 90 minutes after being replaced by Dan Gosling 16 minutes from the end. The last time the 24-year-old made it to the final whistle after starting a game was on 13 September 2014 against Manchester City. Wilshere produced a busy performance as the Cherries secured only their second away point of the campaign. However, he remains without a league goal since May 2015 after one bad miss in a game Eddie Howe, who has been linked with the England manager's job, felt his side should have won. Nordin Amrabat (left) was excellent for Watford, making one goal and twice being denied by fine saves from Artur Boruc. The winger teased and tormented Bournemouth and was a threat throughout. Watford manager Walter Mazzarri, who was celebrating his 55th birthday: "The players have given me a nice present today. If they had have been slightly more concentrated they would have given me three points but I am happy now. "One point today, given the intensity, I am happy with it but I am very happy with the performance. "Isaac Success was excellent, playing in the past not just today. He can improve a lot mainly in the defensive parts but he has a lot of potential." Bournemouth manager Eddie Howe: "We are disappointed, especially taking the lead twice you think it should be enough. It was end to end and very even but we had the best chances in the game. "On another day we take one or two of the missed chances and win the game. We scored two goals away from home and hit the woodwork three times, it has to be a positive thing. "No one was settling for a point. We were disappointed with the goals that we conceded, especially the second one. It is a tough place to come but our expectations are growing and we want to push to greater heights." Watford have conceded in each of their last nine Premier League home games, the longest current run in the competition. Bournemouth scored more than once in a top-flight game for the first time in 12 games. Troy Deeney is now Watford's joint top-scorer in Premier League history with 16, level Odion Ighalo. Joshua King is now Bournemouth's leading scorer in Premier League history with eight goals. Watford are not back in action until 16 October when they travel to Teesside to face Middlesbrough (13:30 BST), while Bournemouth entertain Hull City in their next game on 15 October (15:00 BST). Substitution, Bournemouth. Benik Afobe replaces Callum Wilson. Junior Stanislas (Bournemouth) is shown the yellow card. Attempt saved. Isaac Success (Watford) right footed shot from outside the box is saved in the centre of the goal. Assisted by Roberto Pereyra. Attempt missed. Junior Stanislas (Bournemouth) right footed shot from outside the box is too high. Assisted by Simon Francis. Attempt missed. Isaac Success (Watford) right footed shot from outside the box misses to the left. Assisted by Younes Kaboul. Substitution, Watford. Adlène Guédioura replaces Etienne Capoue. Jack Wilshere (Bournemouth) hits the left post with a left footed shot from the left side of the six yard box. Assisted by Adam Smith. Corner, Bournemouth. Conceded by Younes Kaboul. Attempt blocked. Callum Wilson (Bournemouth) right footed shot from the centre of the box is blocked. Assisted by Adam Smith with a cross. Artur Boruc (Bournemouth) wins a free kick in the defensive half. Goal! Watford 2, Bournemouth 2. Isaac Success (Watford) header from the centre of the box to the top right corner. Assisted by José Holebas with a cross following a set piece situation. Goal! Watford 1, Bournemouth 2. Joshua King (Bournemouth) right footed shot from outside the box to the bottom right corner. Substitution, Bournemouth. Joshua King replaces Jordon Ibe. Dangerous play by Nordin Amrabat (Watford). Attempt saved. Troy Deeney (Watford) header from the centre of the box is saved in the bottom left corner. Assisted by Nordin Amrabat with a cross.